Installing a metal roof on your home or business isn’t always the cheapest options, but that extra investment price can pay off greatly in the long term. There’s a range of benefits associated with making the choice to install metal roofing versus other conventional materials. Let’s explore four ways that metal roofing can benefit your building today and well into the future. They will last significantly longer than other types of roofing. If you’re going to invest in a roof, shouldn’t you invest in one that will last you for a long time? Traditional shingles are only designed to last for about 15 or 20 years. At best, you will probably only get up to 30 years out of other roofing options. But metal roofs can last 50 years or longer. That means you won’t ever have to worry about replacing it once you’re put one on and can get a roof that lasts two or even three times as long as a shingled roof. They can be made to look like a variety of different surfaces. One of the biggest knocks on metal roofing, outside of the price, used to be the look of it – it didn’t necessarily look like it should be one of the most expensive roofing options. But these days, metal roofs can be made to look like wood, stone and many other materials instead. There are so many options for home and business owners to choose from when it comes to the aesthetics of their metal roofs. If safety is a major concern for you, you really can’t go wrong with a metal roof. They are fire-resistant, so in the event of a fire in your home or business, your roof will be protected. It also means that if neighbors are having bonfires or if people are shooting off fireworks near your business, the roof will resist any stray sparks and keep your property secure. They will shed water and snow very easily. Here in Pennsylvania, snowy roofs are common in the wintertime. With a metal roof, you won’t have to worry about that snow sticking around for very long. Metal roofing sheds water and snow better than most other roofs, so that snow and rain will slide right off and help reduce the load on your roof. Are you thinking a metal roof might be the best option for you? 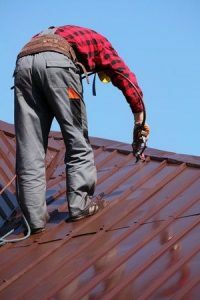 Roofing by Bruce can fill you in on everything you need to know about metal roofing and its many advantages and work with you on your roof replacement or new installation project. Reach out to us at 570-424-7250 today and discover why metal roofs are becoming more popular than ever.